Italian painter and draughtsman. He trained in Florence, first with Andrea de Ceri and from the age of 11 with Ridolfo Ghirlandaio. According to Vasari, he practised drawing by copying Michelangelo s cartoon for the Battle of Cascina (destroyed). For Pope Leo X s entry into Florence in November 1515 he painted an allegorical figure on one of the twelve triumphal arches. Soon after, an obscure Florentine painter called Vaga took Perino to Rome, where he became known as del Vaga. There he continued his drawing studies, copying from works of antiquity and Michelangelo s ceiling in the Sistine Chapel. On the recommendation of Giulio Romano and Giovanni Francesco Penni, he joined Raphael s workshop, where he learnt stuccowork and how to design grotesques, through assisting Giovanni da Udine in the Vatican Logge. Soon he was painting scenes from Raphael s designs, and five or six ceiling frescoes in the Logge, including the Story of Joshua and the Story of David, are generally accepted as his. 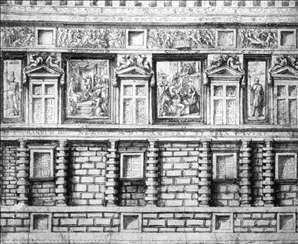 Vasari drew particular attention to scenes under the windows that are painted to look like bronze reliefs (badly damaged). Pictures of this kind became a speciality of Perino s. Before the death of Leo X in 1521, he worked with Giovanni da Udine again, on the ceiling frescoes in the Sala dei Pontefici at the Vatican. On his own he executed the decoration of the hall in Palazzo Baldassini (1520-22) and the Piet in Chiesa di S. Stefano del Cacco. In 1523 he returned to Florence, running away from plague, where made friendship with Rosso Fiorentino and executed an admirable design of 10,000 Martyrs (lost). A year later he returned to Rome and frescoed Cappella Pucci in Chiesa della Trinit dei Monti. 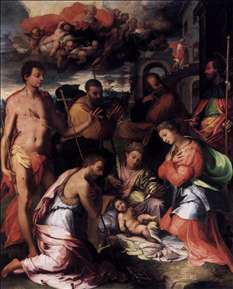 In 1527 Perin was invited by Andrea Doria to decorate his Palace of Fassolo in Genoa, where he also executed numerous altarpieces and designs for the tapestries. 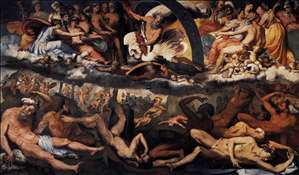 In 1536 he returned to Rome and received important orders from the papal court: decoration of Sala Paolina and other halls in Castel Sant Angelo, frescoes in Chiesa di S.Marcello. Vitality and elegance of his style, made Perin del Vaga one of the characters of the Mannerism with a big number of followers in Rome and Genoa. See more details about "Adoration of the Child"
See more details about "The Fall of the Giants"
See more details about "North Façade of the Villa Doria"